Marketers and eCommerce teams alike know that the strategies used to get a customer’s first glance are far different than those needed to create loyalty. So how do you ensure that you are using the right strategy at the right time with each of your customers? 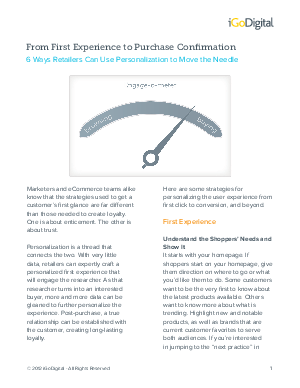 Personalization is a thread that connects the two. With very little data, retailers can expertly craft a personalized first experience that will engage the shopper. As that shopper turns into an interested buyer, more and more data can be gleaned to further personalize the experience. Post-purchase, a true relationship can be established with the customer, creating long-lasting loyalty. From first click to conversion and beyond, here are some strategies for personalizing the user experience.